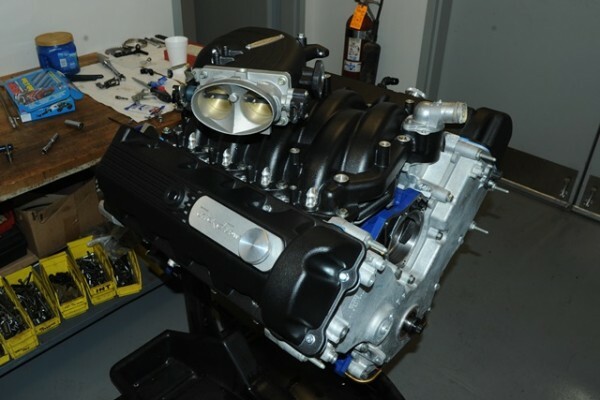 Coyote Alternative: Trick Flow Gets 466 HP Out of a Ford 2V Mod Motor! Everybody that has Ford blue running through their veins loves the 5.0L Coyote. And with good reason—a production Coyote makes 435 horsepower and 400 ft.-lbs. 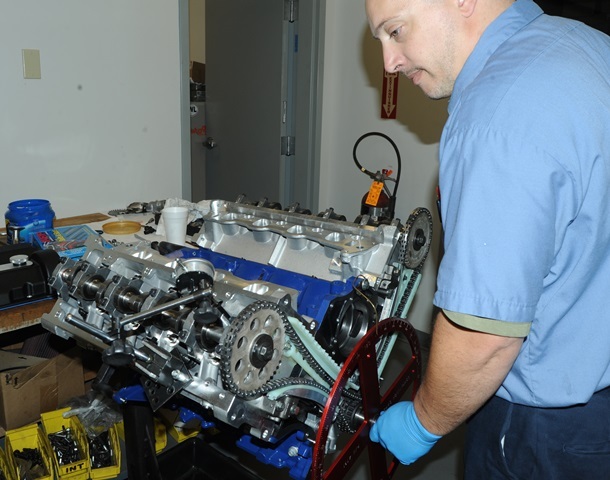 of torque, and they’re readily available in crate engine form. 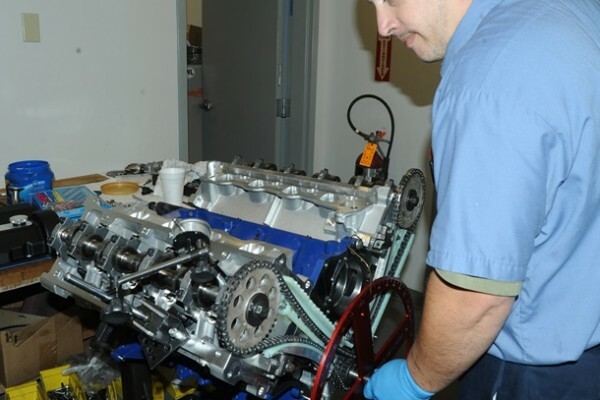 But that doesn’t mean the older 4.6L Ford modular motor has to choke on the Coyote’s dust. 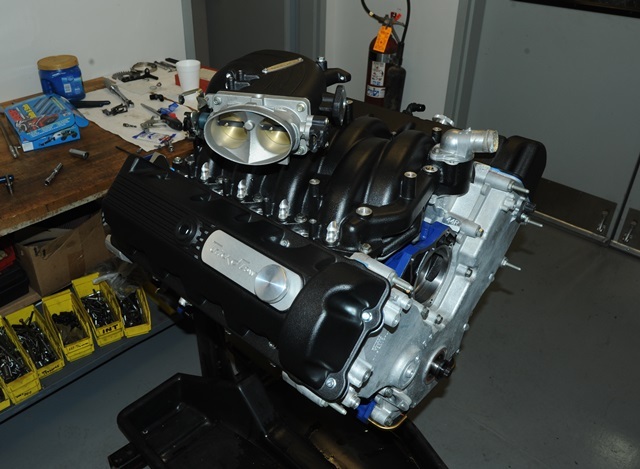 In fact, Trick Flow Specialties has built a 5.3L 2V that makes plenty of power on 93 octane gas, features all-new parts, and is practically a drop-in for any 1996-2010 Mustang. Interested? On the dyno with a dual 57mm throttle body, 70mm Mass Airflow sensor, 36 lb.-hr. Ford Performance fuel injectors, and a pair of Pace Setter 1 3/4 inch primary tube headers, the 5.3L made 466 peak horsepower and 414 ft.-lbs. peak torque. Put that in a lightweight SN95 or New Edge Mustang and you’ll have a lot of fun. 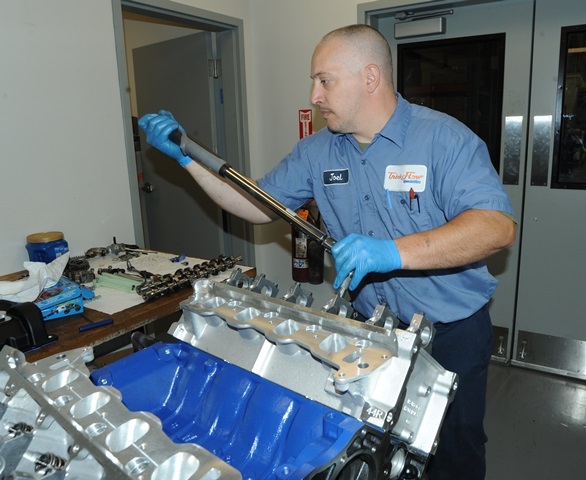 Summit Racing has even made it easy by creating 5.3L Ford Modular Engine Combos. 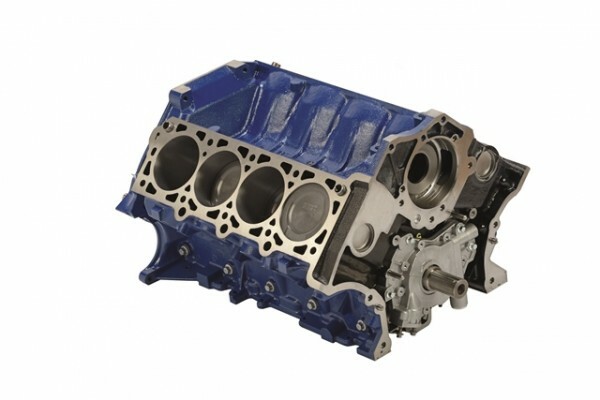 If you’re considering building a stout Ford modular V8 from the ground up, base it on this Ford Performance 5.3L Modular Short Block Assembly. 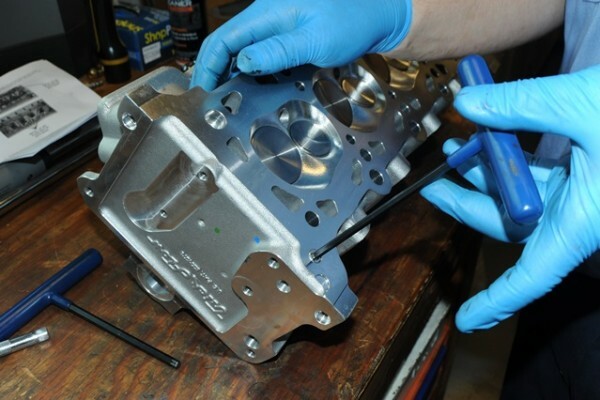 The recipe is simple—take a Boss iron block and stuff it with an Eagle forged crank and rods plus a set of Mahle forged pistons compatible with 2-, 3-, and 4V cylinder heads. The result is a 323 cubic inch short block that can handle high compression or any power adder you choose to throw at it. 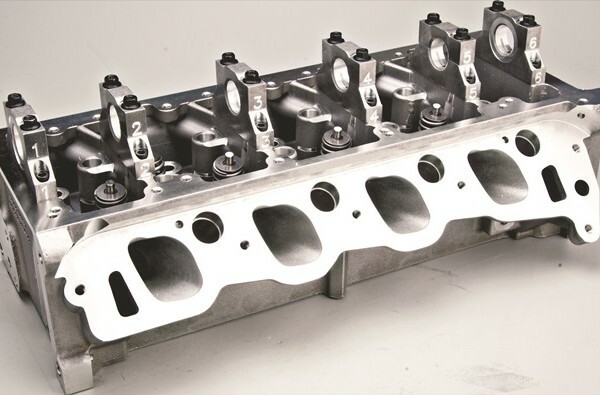 The other major part of Trick Flow’s mod motor equation is a set of its own Twisted Wedge Race 195 cylinder heads. 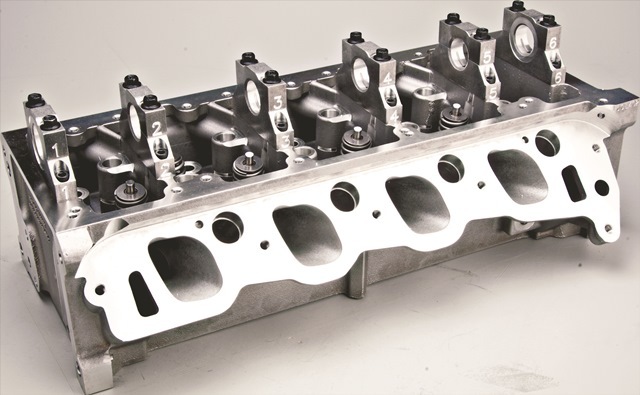 The 2V-style heads are designed for big bore naturally aspirated engines and are equally at home on engines with superchargers, turbos, and big shots of nitrous oxide. The Race 195s feature CNC-profiled 44cc Twisted Wedge combustion chambers that boost mid-lift airflow and provide plenty of clearance for high lift cams and larger valves without altering bore size or flycutting pistons. Other features include CNC Competition Ported 195cc intake/95cc exhaust runners, and valve springs rated to .650 inch valve lift. Trick Flow includes an oil passage plug kit with the heads. 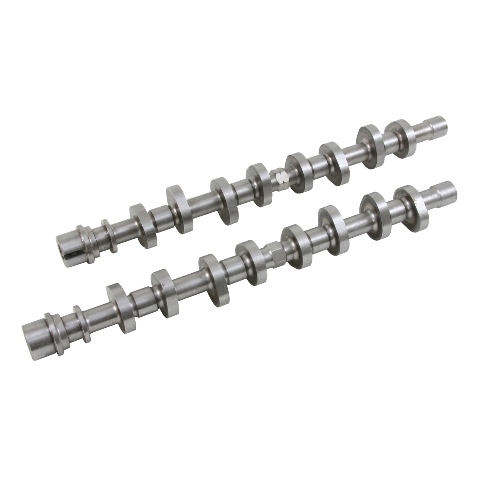 Both heads get a 1/8 inch NPT plug on the deck as shown here. 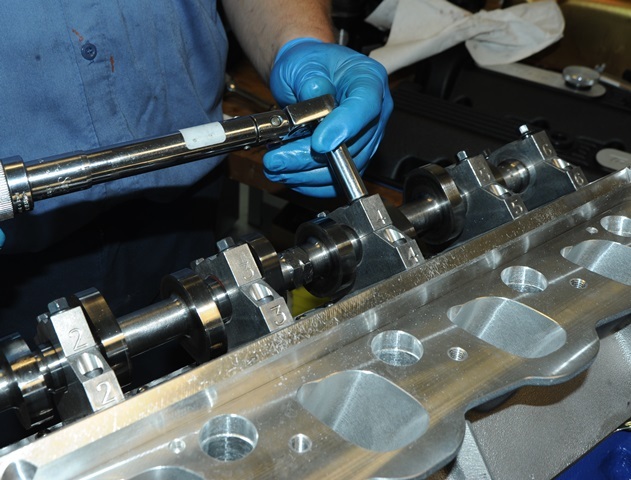 Each head gets six 1/8 inch NPT plugs to seal the oil passages on the exhaust side. 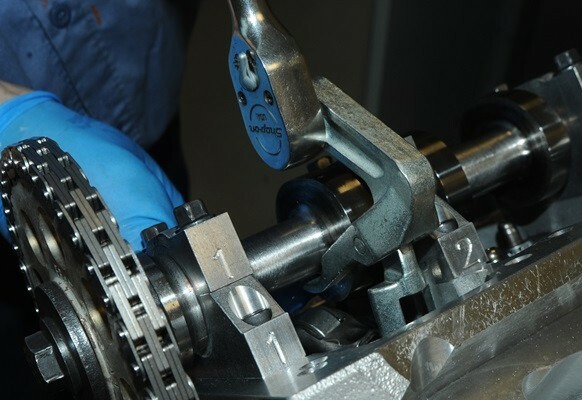 The heads also get two 1/4 and two 1/2 inch NPT plugs to seal the oil passages on both ends. This 1/4 inch plug must be filled flush with RTV silicone to seal against the timing cover. Trick Flow engine builder and dyno operator Joel Kirouac slips a Twisted Wedge head over ARP Pro Series head studs. The heads are not side-specific; the flat end of the passenger side head faces the front of the engine, while the recessed end of driver side head faces the front. It’s a good idea to mark the heads L and R so you don’t mix them up during installation. It does happen! Joel torques the ARP head stud nuts to 100 ft.-lbs. in three equal steps using ARP assembly lube. Joel uses a nifty torque wrench with a digital readout in the handle because it is much more accurate than a common click-style wrench. 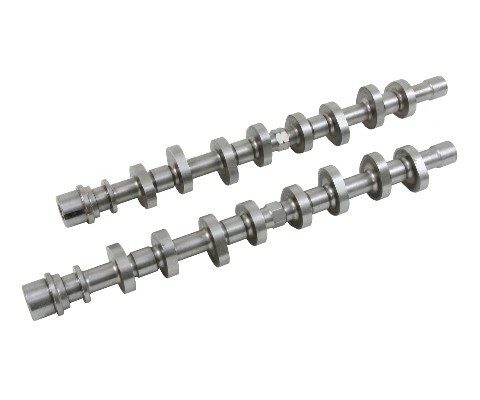 The Track Max Stage 2 camshafts are rated at .580-inch lift and 234° duration @.050 inch, and offer strong mid- to top-end power and a 1,800-6,500 rpm powerband. 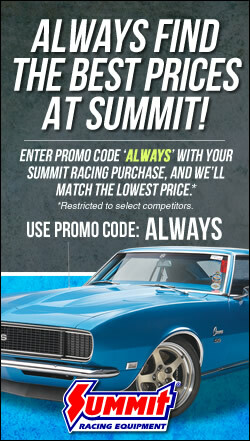 They’re a good choice for a naturally aspirated street engine that sees some track duty. With the cams and hydraulic lash adjusters in place and the cam journals lubed, the journal caps are installed and torqued to 150 in.-lbs. or 12.5 ft.-lbs. starting with the center cap and working toward the end caps. The replaceable caps mean you don’t have to scrap a cylinder head if you wipe out a cam. Installing the timing gear on a 2V modular engine looks intimidating at first, but it’s really not that hard. 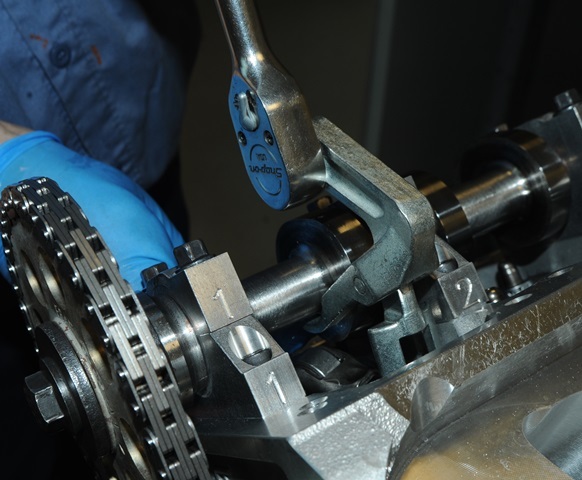 Trick Flow offers a timing kit with everything you’ll need to do the job, including crank gears that can be adjusted +/-8° bank to bank. The instructions that come with the Twisted Wedge heads will walk you through the process, or you can find plenty of how-to videos on YouTube if you’re the visual-learning type. Joel degrees in the Track Max cams to match the specs on the cam card. 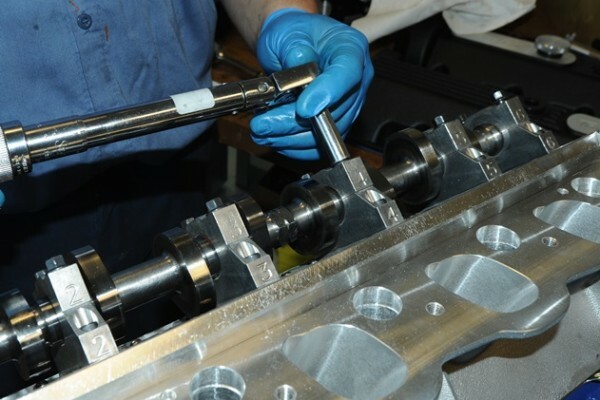 The Twisted Wedge cylinder head instructions show you how to time the camshafts. 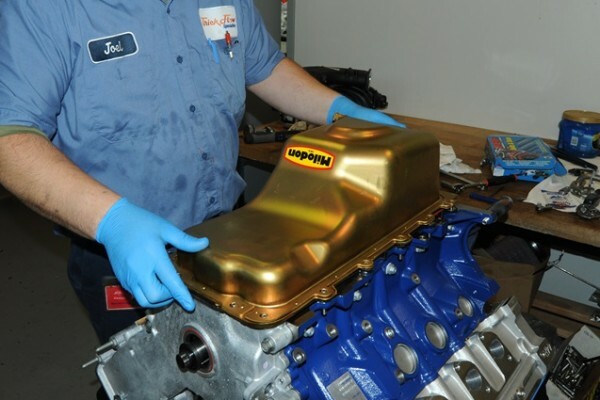 The Milodon oil pan is a Mustang-style stock replacement unit. 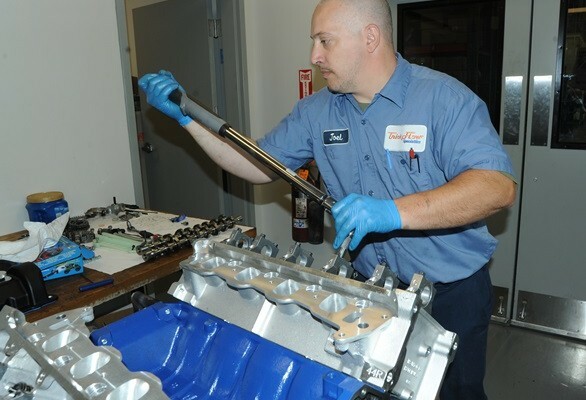 The Ford Performance short block comes with a high volume oil pump, but not the pickup. A stock pickup will work fine, but some aftermarket pickups might interfere with the factory windage tray. Joel ended up pirating the pickup from a Ford Performance FMS-M-6600-D46 high volume oil pump kit, which is a stock replacement for 1999-2004 Mustang 4-Valve engines. One 323 cubic inch 2V waiting for its turn on the dyno. The intake is a Trick Flow Track Heat EFI manifold. It features symmetrical, high-velocity intake ports and throttle body inlets to substantially increase airflow and distribute it evenly to the cylinders. The powerband is 3,500 to 8,000-plus RPM. The throttled body is a factory 4-Valve Cobra unit. The valve covers are Trick Flow cast aluminum. 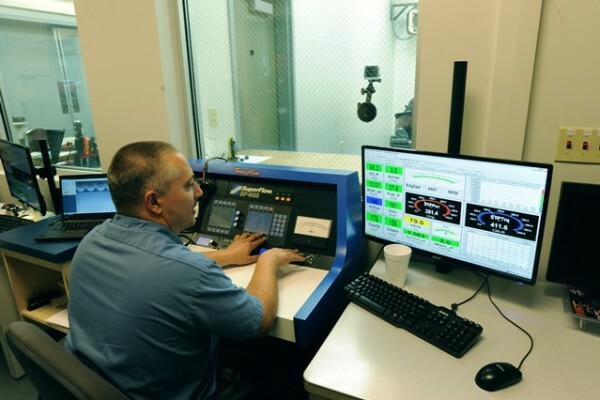 Joel at the controls of Trick Flow’s Superflow dyno. 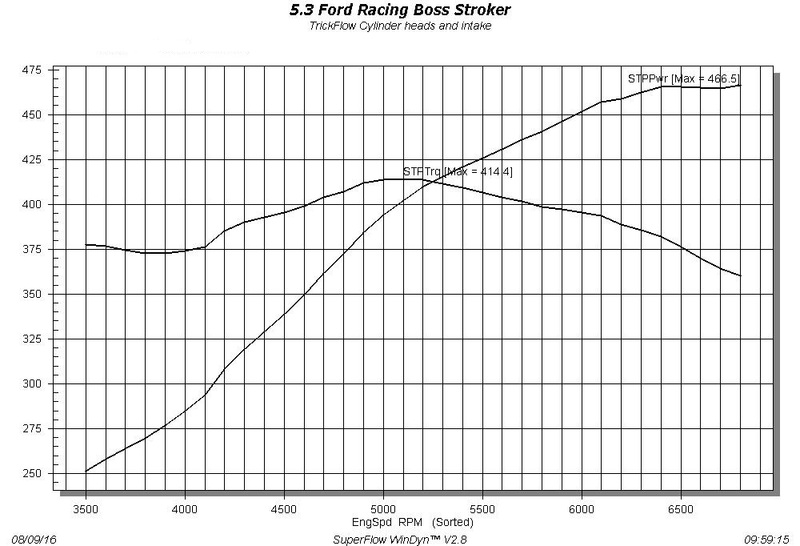 The 5.3L was controlled through a Ford 2002 Mustang ECU and tuned with an SCT X4 Power Flash programmer. Like most Ford Modulars, the 5.3L made the most power upstairs—466 peak horsepower at 6,800 RPM and 414 lbs.-ft. peak torque at about 5,300 RPM. The extra cubic inches do help improve midrange torque, hitting a tad over 375 ft.-lbs. at 3,500 rpm. This is an engine that would be happiest strapped to a five- or six-speed manual. Ed, what was the TFS model # and chamber size for your 5.4L build? 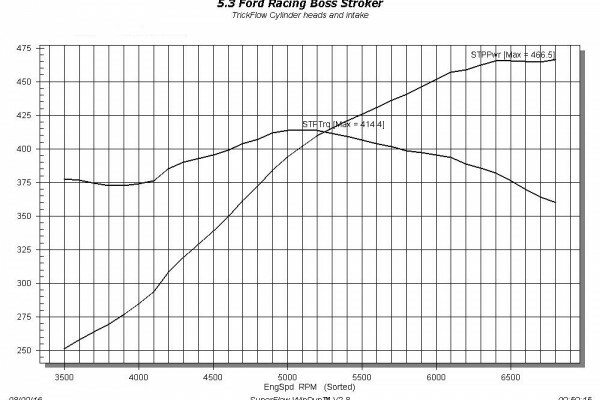 I am building a 5.4L 2V engine based on a stock 2008 GT500 short block and am trying to figure out which TFS to use. I’m using a Comp Cams XE278AH Camshaft along with 3.73 gears in the rear along with a 2400 stall speed converter in a Ford 6spd automatic transmission. Your help is appreciated. Ever get that on the dyno? 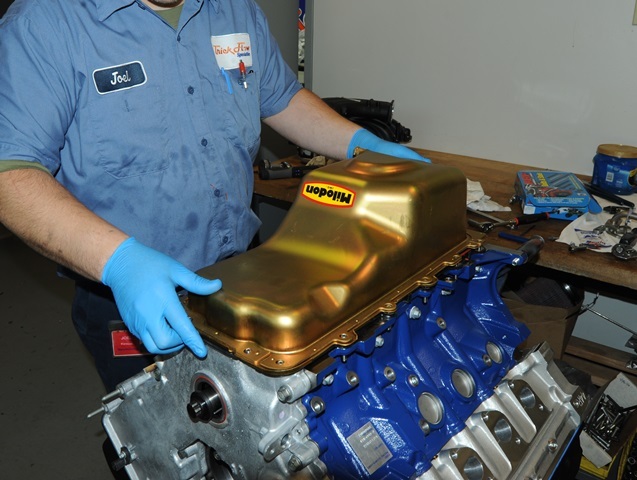 Does it still weigh 685lbs and have 30″ width at the valve covers? How about an SN95 Mark IV chevy swap? Yes, I really dont get the Chevy swap. It makes little sense unless your mod motor and the heads are destroyed and you just so happen to have an LS laying around or were given one. What modifications would be required to install into an 05 Crown Vic? I’m rebuilding a 5.4l iron block out of a 2000 Harley-Davidson edition. I’m looking for a stroker set up. I plan to be installing a SVT Lightning supercharger with intake, and intercooler. I’m putting a 1954 F100 on the harley chassis. What is the compression with the 38cc heads. How much boost would you recommend from a procharger p1sc?